Underneath this stylish accessory is my lovely wheaten coat. If you're trying to choose between a Norfolk and soft-coated wheaten terrier, your decision boils down to two very distinct dogs. Both dogs started out as vermin hunters, the Norfolk in England and the wheaten in Ireland. Today, they're best known as good-natured companion dogs. The Norfolk terrier tops out at between 9 to 10 inches high at the shoulder, weighing between 11 and 12 pounds. Males are larger than females. The Norwich terrier is a similar breed, once considered a Norfolk, but the Norwich has pricked, fox-like ears while the Norfolk's ears hang down. The soft-coated wheaten terrier is much larger, maturing between 17 and 19 inches high and weighing between 30 and 40 pounds. Again, males are larger than females. The soft-coated wheaten gets his name from his golden wheat color and soft, wavy coat. The Norfolk terrier's coloring also comes in wheaten, along with red, black and tan, or the grayish shade known as grizzle. The wheaten terrier is single-coated, while the wiry hair of the Norfolk contains an undercoat. One factor that may determine your choice of dogs is the amount of grooming involved. If you don't particularly relish grooming your dog, the soft-coated wheaten terrier might not be the canine for you. He requires daily brushing to prevent his soft coat from matting, along with regular trips to the groomer to keep him looking spruce. The Norfolk, on the other hand, is relatively easy maintenance in the grooming department. A good once-a-week brushing should keep him in suitable shape. You might want to strip his coat semi-annually, which means pulling out the old outer coat with a strip tool, or have a groomer do it. You can also leave him "natural," which makes him look a bit scruffy, shedding more often. 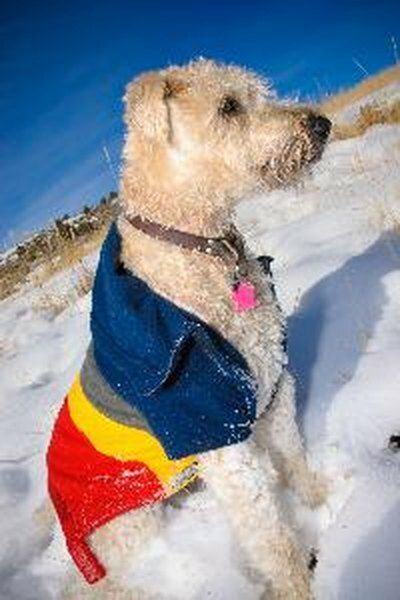 The American Kennel Club describes the wheaten as "less scrappy than other terriers," while the Norfolk is noted for his gameness and loyalty. Both breeds tend to be good with other pets and kids and suitable for urban, suburban or rural life. Both breeds are active, curious dogs. Of the two, the Norfolk is probably easier to train, but both are terriers and with that comes independence and terrier 'tude. Take either breed to obedience class to learn the basics. Remember, terriers live to hunt so neither can be trusted to stay put if let loose, unless they have been very well-trained.